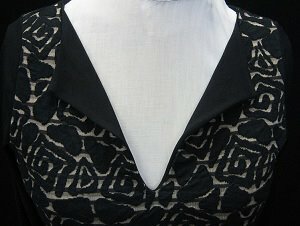 The Keyhole Top pattern is great at hip length, fingertip length and dress length. It has a close fitting armhole and waistline shaping. To achieve the slight a-line shaping seen here I laid a straight ruler at the widest hip point and angled it 2 inches. I love this stable, sweatery-knit fabric for a variety of reasons. First of all, the black flower-ish design is "very" black and secondly the graphic print is uniquely feminine. Third, it is very lightweight and incredibly soft to the touch. 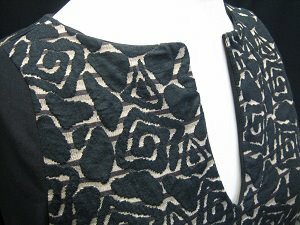 The pattern for the Keyhole Top is self-lined.The self lining takes the sometimes problematic top stitching issue out of play, and makes a nice neckline finish. The sleeveless version can be made reversible using two compatible fabrics. The neckline can be cut without the slit for a beautifully shaped boat neckline. Instead of self lining the entire garment I simply lined the bodice. I LOVE the coordinating black sleeves and fold over neckline. They serve to highlight both the print and design. 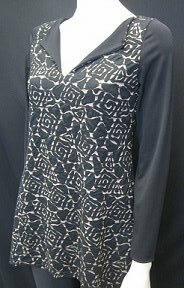 This top is equally great in all types of knits both prints and solids. The print is S1048 and the black is 9oz. ITY 671.